You may have heard about Bulldozer, but it won’t live for much longer. That is solely because it will turn from a code name into real products shipping later this quarter as Opteron 4000 series also known as Valencia and Opteron 6000 series also known as Interlagos. Intel currently owns about 80% of the server space, but AMD aims to change that with Bulldozer. 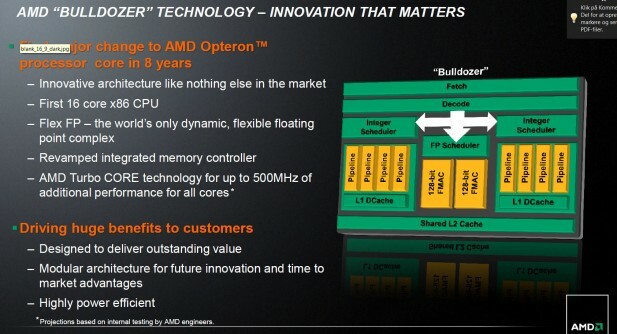 The 2 families represent a brand new microarchitecture from AMD. Actually the first new architecture in many years. The interesting thing is that we no longer talk about cores, but about modules. A Bulldozer module consists of 2 cores that most important share the FP pipeline. The concept is called Flex FP and the idea is that each core either its own 128 bit FPU or the 2 PU’s can be combined to a shared 256 bit FPU. AMD has yet to confirm the exact SKU’s and speeds, but we know that the 4000 will appear with 6 and 8 cores with 14MB respectively 16MB of total cache divided up as 16KB level 1data cache per core and 64KB level 1 cache per module. Level 2 cache is 1MB per core and level 3 is 8MB per socket. The memory controller supports a dual channel configuration. The more powerful 6000 series will appear with 8, 12 and 16 cores with up to 24MB cache distributes the same way as the 4000 series. The memory controller will support a maximum of 4 channels. Bulldozer will be fabbed at GlobalFoundries in Dresden and will be the first processor to adopt 32nm process technology with both SOI and High-K Metal Gates.